After Glary Utilities Pro and Glary Utilities Professional Edition 3.3 , now Glarysoft.com presenting Glary Utilities Professional Edition v3. 6.0.125 as a gift , obviously , it would for free . I found this great giveaway yesterday evening , I was quite busy therefore I could not share this with all of you . If you are not familiar with Glary Utilities then please let me explain . If you are encountering slow system speed and performance despite of having a good or high system resources and getting lots of system errors , Glary Utilities helps you to get rid of all problems and enjoy an error free digital journey . Glary Utilities has a bundle of system optimization tools such as registry repair and cleaner , defragmenter , uninstall manager , startup manager and many other . I love its registry cleaner feature , well invalid or unnecessary registry files is a big reason to slow down your computer/laptop’s speed and performance , its registry cleaner feature scans deeply and removes unnecessary registry items without messing with important system files . It has lots of other optimization features . It is just not a speed and performance optimization tool , It has also great features to protect your privacy and security . Its anti malware feature detects smartly and intelligently and removes malware that could be a risk for your security . Its privacy eraser feature protects your offline and online privacy by removing all your computer/laptop history and your browser activities like searching , downloading etc. You can read complete detail about it on the Homepage . 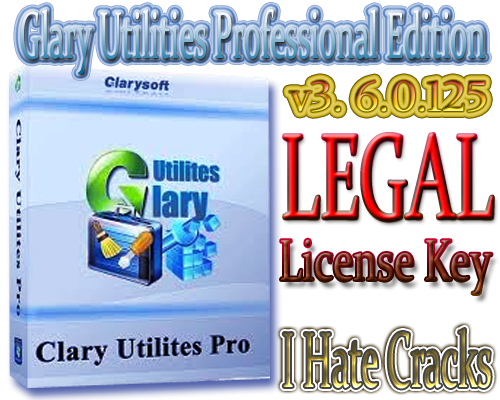 If you want to use latest version Glary Utilities Professional Edition v3. 6.0.125 then follow these instructions . Actually this is a limited time giveaway offer and unfortunately I have no idea that what is the expiry date .Download Glary Utilities Professional Edition v3. 6.0.125 freeware version from this link and install . Now use this registration code to activate its pro features .